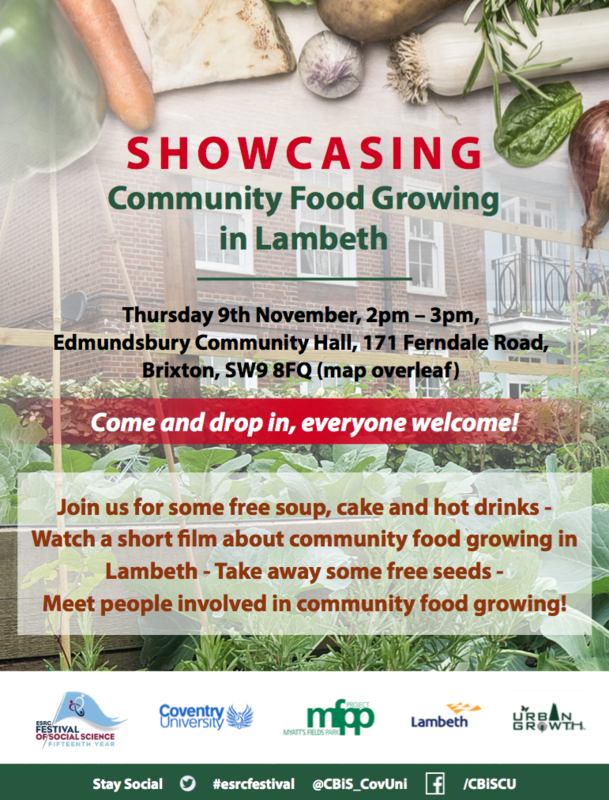 There will be an event this Thursday on Edmundsbury Court Estate to showcase community food growing in Lambeth. See below for more details and click the image to download a PDF that includes directions to the venue. As has been described in previous posts, we have been monitoring the level of pollution on Christchurch Road, as part of the Love Lambeth Air project. The monitoring ran for a period of 6 months from November 2016 until April 2017. The project was rounded off with a feedback event on 14th June 2017, which was held at St. John’s Church in Waterloo. See here for a document describing this event. 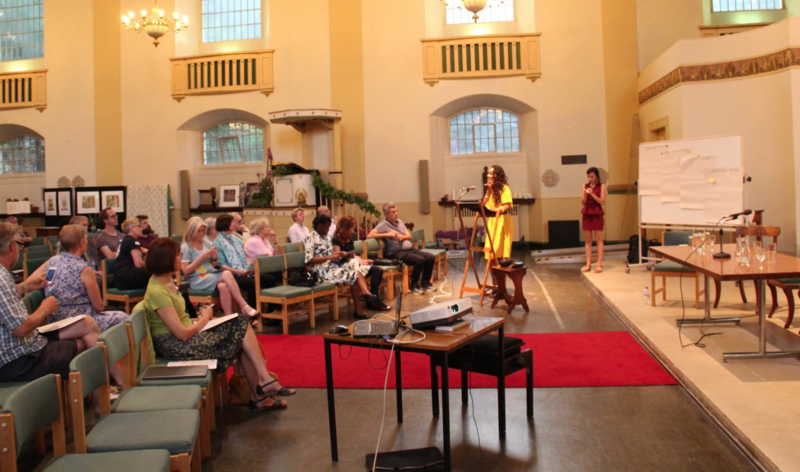 Amongst several others, presentations were given by Claire Baldock from Mapping for Change, May Van Schalkwyk, an oncologist and Sarah Hudson and Sheila D’Souza, residents of the Barbican and Marylebone, respectively. Their presentations can be downloaded by clicking on their names. 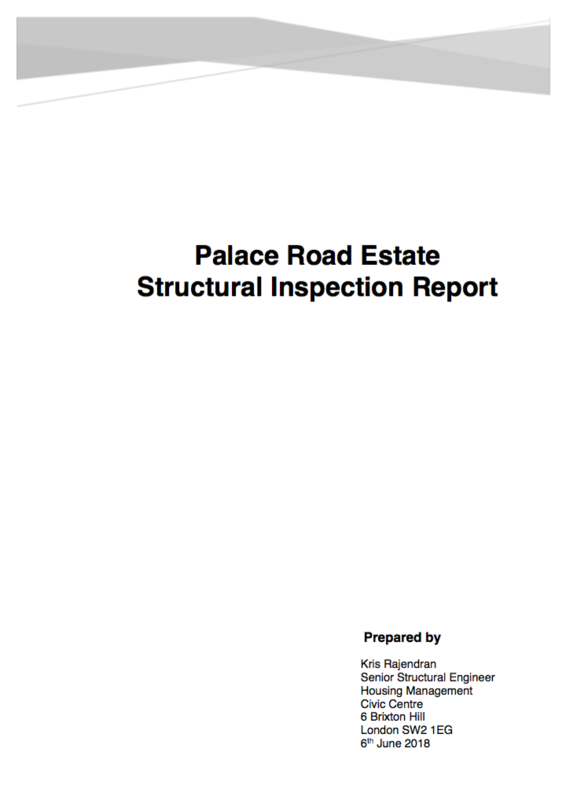 The final report can be downloaded here and the raw data is here. There is also a one page summary of the results from across Lambeth. The feedback event at St. John’s Church, Waterloo. 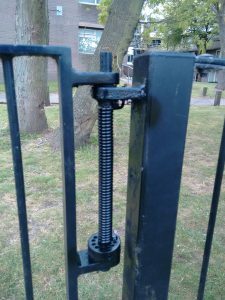 For several years the play area has been open to dogs, because the springs on the gates had broken. 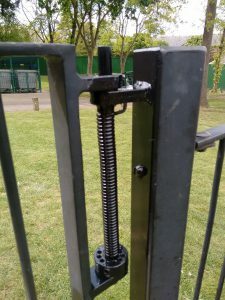 After months of nagging by the committee, the springs have now been replaced, so children should now be able to play without worrying about dog mess. Do you like what PRERA is doing? Would you like to join us in making the estate cleaner, greener and a friendlier place? Contact us! 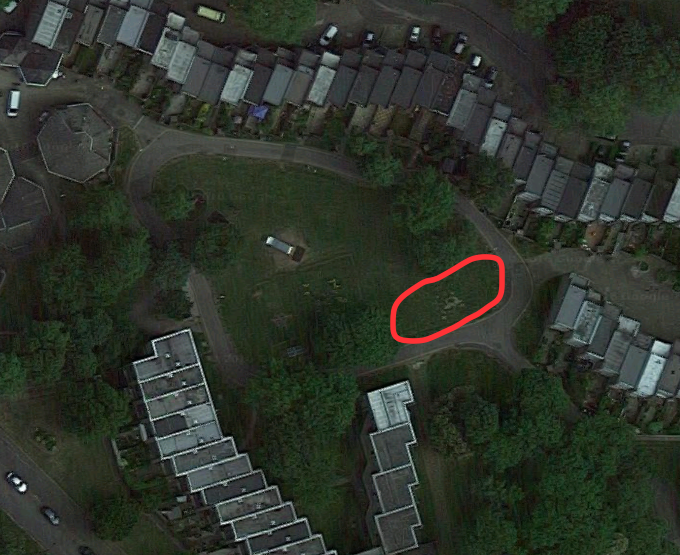 Did you know that there is a range of sports facilities just over the road from Palace Road Estate? The City Heights E-act Academy has a sports hall, dance studio and outdoor multi-use games area (MUGA) that are all available to the public. They can be used at weekends and on weekday evenings. Bookings can be made here. If you are a badminton player, you may be interested in joining the South West Strings Badminton Club who meet at the school on Tuesday evenings. An interim report has been published by Mapping for Change, the organisation coordinating the air pollution monitoring project across Lambeth. You can download the report here. 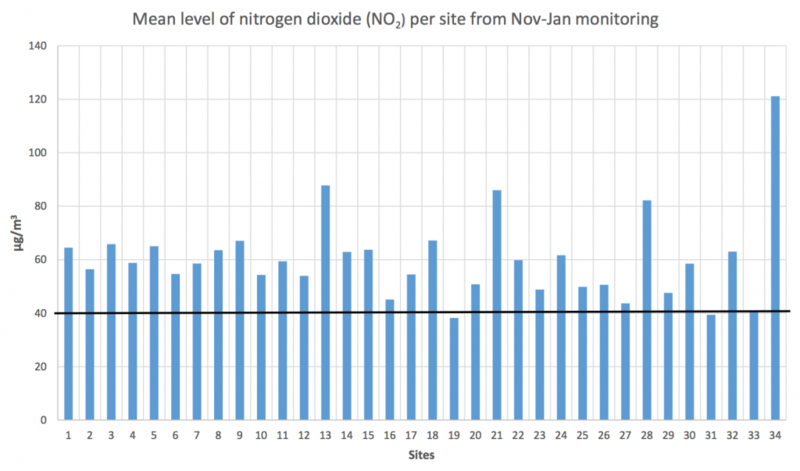 A graph from the report showing that our local monitoring site (number 28) had the fourth highest level of nitrogen dioxide pollution or all the sites across Lambeth (when avarage over the first three months of the project). The outdoor gym has arrived! After months of anticipation, our new outdoor gym has arrived! Now that the weather is warmer, why not try it out and let us know what you think? 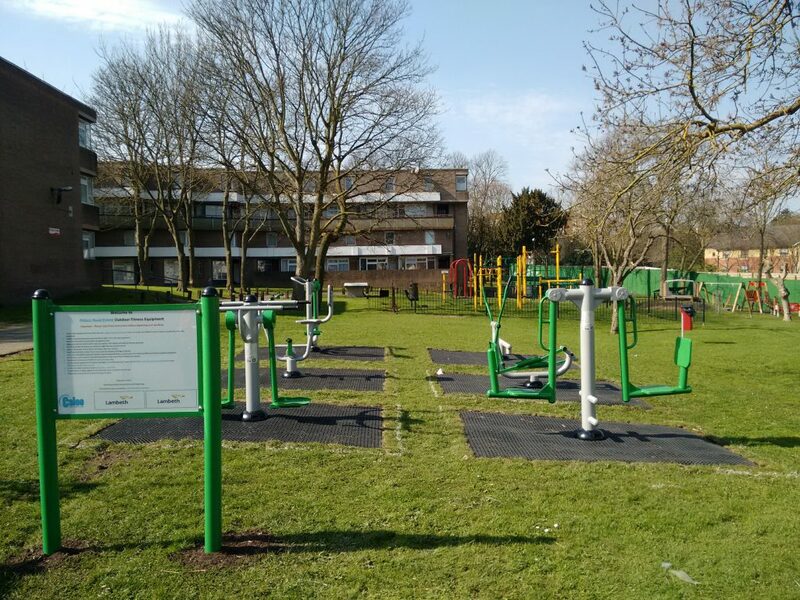 It’s been a while since we posted about the new outdoor gym. We can now announce that it is scheduled to be arrive later this month! It will be installed on 23rd and 24th March. 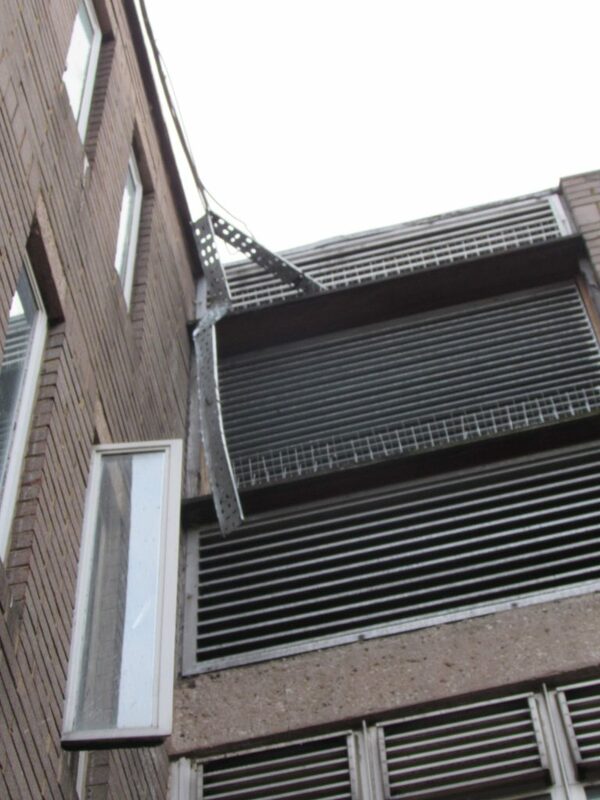 The equipment should be installed with rubber matting around it, to avoid the area become muddy. There will be six items of equipment and they should be painted tastefully in shades of dark green and grey. 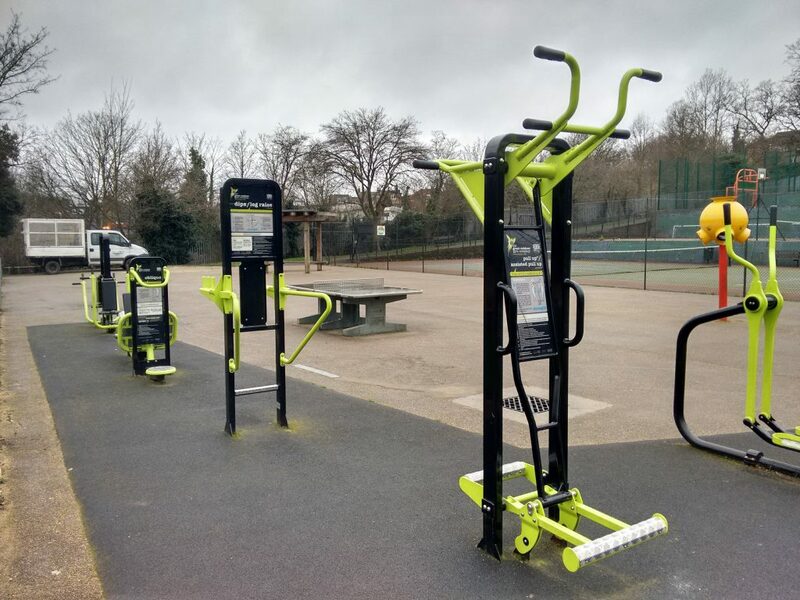 Similar gym equipment installed at Hillside Gardens Park. Our will be dark green and grey. It’s the first of March and time to replace the pollution-monitoring diffusion tube on Christchurch Road (see this post for more details). The results for the first three months have now been published. You can see them on the air pollution map. Sadly the latest result (for January 2017) is the worst yet – 101µg/m3 – two and half times the World Health Organisation guideline for this pollutant.